The use of archaeology to understand the social processes of the contemporary to set my life path. I always think about my road to anthropology and archaeology as one of those “a-ha” moments people talk about: it’s something you are continuously waiting for that has no guarantee of happening, but it happened for me. Back in 2015, I was certain of going the premedical school path. After taking a freshman biology course the University of Michigan, I quickly realized that it was not something I could do for the rest of my life. Over the course of that initial semester, nothing seemed to spark my interest. The following semester I enrolled in an anthropology course simply to fill a university requirement. I come from a very small farm town, so I had no idea what anthropology was. Jason De León, who has become a great mentor to me, was the professor teaching Anthropology 101. I’m sure he gave an enthusiastic lecture, as his course is really what has set me on the trajectory I am on now. I took courses from all of the sub-fields and was interested in both cultural and archaeological anthropology. The Sonoran Desert is full of hostile terrain populated with prickly flora and dangerous fauna, and offering little protection from the extreme temperature. Nicole Smith. I remembered learning about De León’s work with the Undocumented Migration Project (UMP), a long-term anthropological study of undocumented migration between Mexico and the United States that uses ethnography, archaeology, and forensic science to better understand this clandestine social process. Interested in how this project combined different disciplines in order to provide a more comprehensive understanding of the experiences of undocumented migrants, I joined the project in my junior year. I was given the opportunity to utilize the artifacts the UMP had collected in past field seasons and was hoping to research something that hadn’t been tapped into yet. I realized that children were scarcely mentioned, but knew, they play significant roles within the migration process. The project sheds a light on the experiences of child migrants who are subjected to the same socio-political forces as adults. For the Undergraduate Research Opportunity Program (UROP), I wanted my research to concentrate on the materiality and memory of child migrants, research that is now part of my senior honors thesis. Fortunately, over the summer of 2018, I was given the opportunity to conduct fieldwork with the UMP in southern Arizona. Having this experience, really helped me conceptualize the artifacts I was looking at in the lab back in Michigan, and it also helped me better understand the hostile environmental conditions that migrants have to endure, as I was experiencing that environment first-hand. Part of this project involves the voices of those who migrated when they were children. I have been interviewing these individuals, asking if they would share their stories with me—about what they experienced and the things that they remember. The stories they shared with me have been so impactful and have really impressed upon me how important it is that they are heard. Children are often set aside when talking or thinking about such an “adult” issue, yet they are still subjected to the same socio-political forces as adults. For me, this project is more than just producing a research paper, but also about shedding a light on the experiences of child migrants that have been cast in the dark for too long. Although the other part of my project, the materiality, is also important, I want to emphasize that it is the voices that the project privileges. Archaeology is often thought to be about artifacts from a distant past, but through this type of work we are showing that it doesn’t have to be: archaeological remains can be just weeks old. The artifacts I am looking at range from articles of clothing, backpacks, and baby powder, to Pedialyte bottles. My project demonstrates the use of archaeology to understand the social processes of the contemporary. While new and relatively unexplored, I think that this is a route that could provide some interesting nuances within the field of archaeology, especially in terms of future directions. Contemporary archaeology is certainly something that I hope to continue moving forward. 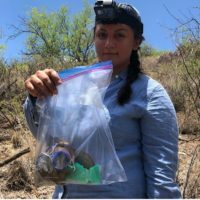 Nicole Smith is an undergraduate at the University of Michigan and a 2018 Diversity Travel Award winner for the Archaeology Division. Sandra L. López Varela is contributing editor for the Archaeology Division.